It can be a tough time relocating pets to North Cyprus or anywhere else in the world for that matter, as most of us have been brought up with the view that pets are part of the family and we would not consider aircraft holds five star travel by any stretch of the imagination. However, when all is said and done they are usually a resilient bunch who will try and lick your face off when its all over, letting you know that they still love you to bits! So, it’s only then that you start to think about what to do should you need to register your dog or need the services of a vet perhaps. In most cases word of mouth works wonders here and you can usually pick up lots of tips and advice from pet owners who have gone through the same process. It is certainly worth an initial visit to a local vet, of which there seem to be plenty, to give your pet the once over, and also to obtain a book which will detail and record all vaccinations and treatments such as worming, de-fleeing and the like. The vet will also stamp the book with follow up dates as well so that you know when the next ones are due. Their standard of care as well as their concern for animal welfare is highly commendable such is their commitment to ensure our pets receive the best care and attention at times of stress and worry, so you should feel confident your loved ones are in safe hands. There are particular vets that the expat community will go to, and you can easily find out about the ones in your area by asking neighbours and other pet owners. With all dogs in North Cyprus they must be registered. We do wonder if anyone pays any attention to this legal requirement most of them time, as anyone who lives here will tell you there are plenty of dogs, whether they are left to roam around by their owners or indeed homed dogs that are not registered. However, it should be done as should your dog get lost and then be found by someone else, it could potentially save a lot of heartache as your pet can be identified quickly. It’s a very simple process and all you need to do is visit your local councils Health Department where they will take the details of your dog from the book given to you by the vet. 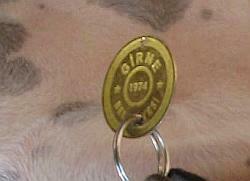 Your dog will be issued with a number on a metal disc which needs to be attached to the dog’s collar. At the time of writing this will cost you 50TL to do, so not so expensive as to make it prohibitive. So, no excuse as it is a very simple procedure! Introduced in 2014 is also a requirement for dogs to be micro-chipped, should they obviously not already be done so if you have bought them with you when relocating here. Cost at time of writing is 70TL and can be done by most registered vets. You can also find certain pet services in North Cyprus too which you can generally find out about via the veterinary surgeries. There are people who will bath and groom your dogs, people who run kennels and catteries should you fancy a holiday without your pet, or if you need to go back to your homeland for a short period. 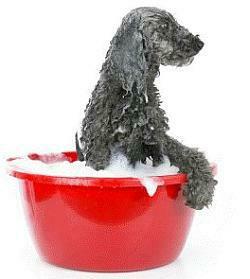 There are also people who can dog or cat-sit whilst you are away if you prefer not to put them in kennels. We hope that this article has given you some idea of the things that are required when you own a dog in North Cyprus and what is available for your pets in terms of veterinary care and other areas. 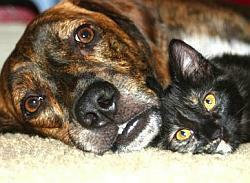 If you are looking to relocate a pet to North Cyprus then click this link for more information.